Have you ever wondered about the science behind the discoveries and fossils at Dinosaur Ridge? Dr. Martin Lockley: Dr. Lockley is a Welsh paleontologist who discovered the dinosaur courtship scratches and the first raptor track found in Colorado at Dinosaur Ridge. Kermit Shields: Kermit Shields received his geology degrees and spent his professional career with Mobil Oil in a variety of production and exploration jobs in both domestic and international offices. After retiring, he became an active volunteer at both the Denver Museum of Nature and Science and at Dinosaur Ridge. He has been on the Friends of Dinosaur Ridge board of directors since 2006. Dr. Libby Prueher: Dr. Prueher is a climate and environmental scientist with expertise in climatology, petrology, and volcanology. Norb Cygan: Norb Cygan has 65 years of practicing geology around the world and 25+ years as a guide at Dinosaur Ridge. He enjoys working with visitors and students of all ages. 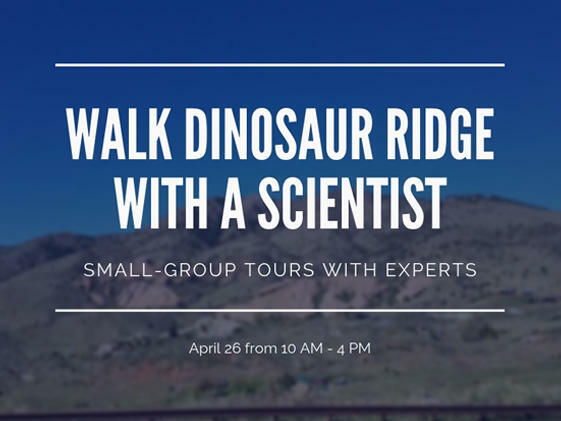 These exclusive tours offer you private access to scientists who can give you insider secrets about all of the sites at Dinosaur Ridge. Tours are 2 hours in length and will depart from the Dinosaur Ridge Main Visitor Center at 10:00, 10:30 and 11:00 am AND 1:00, 1:30 and 2:00 pm on Friday, April 26. Each tour is available for $20/person and is limited to 15 people. Tours will start at the west gate of Dinosaur Ridge and walk back forward in time towards the east gate. Tours will depart rain or shine.